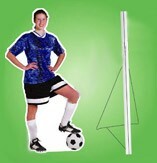 Create a custom cut out standee of any character or product display for great eye catching promotion. Our foam board standees include high resolution custom printed graphics on sturdy 5mm thick foam board, along with a custom die cut out of the shape of the image provided by your own digital artwork. The foam board standees come with a thin metal stand that easily sets up in a couple minutes for great stability and portability. Other sizes also available.